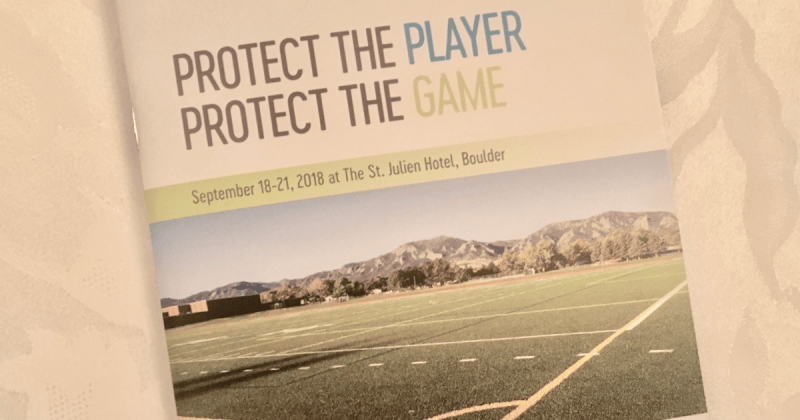 I arrived to Boulder, Colorado yesterday for the Brock USA Summit: Protect the Player, Protect the Game: Creating the Optimal Sports Environment for the Athlete. While most of the traveling I do for the Soccer Parenting Association involves speaking and coach/parent education – this is a conference I was invited to attend as an observer. I am looking forward to listening, learning more about the fields our children play on, and developing my thoughts and opinions about how minimum field standards and safety need to become a more mainstream thought process for parents. There are about 150 people at this conference, and I – along with the Sales Rep who invited me here – Ronnie Pascale – are the only “soccer people.” Most of the attendees are architects, civil engineers, or landscape architects. Being the daughter of an architect, I actually feel quite comfortable here!! We were hosted to a dinner last night where I had the pleasure of meeting two of the founders of Brock USA. I was impressed immediately with the passion they have for safety, testing their product, and who believe in industry-wide innovation and collaboration in order to provide safer sports fields for players. Brock USA manufactures the “shock pad.” This is a product that goes under the synthetic field surface and adds a layer of protection and safety to field surfaces. I will continue to update this post through out the next few days as I learn more. We just finished our first session and I think I could write an entire post from it! We were joined via Skype by Buddy Teevens, the Head Football Coach at Dartmouth University. Coach Teevens makes his players' safety a priority (well, hopefully all coaches do this!). Dartmouth University has a Shock Pad under their playing surfaces and he said he feels more comfortable training on the turf than on the grass field! (in New Hampshire with the weather there plus the nature of football in general - there are issues with the grass fields getting too hard due to compact issues) I asked him if he felt parents were starting to ask more questions about field surfaces during the recruiting process and he said "yes, definitely." He went on to say he felt his safe fields have helped him recruit and sign more student athletes...parents ultimately deciding on Dartmouth because their child would be less likely to be injured with the Shock Pad. I've been in the middle of the recruiting process with my daughter and realize I want to learn more about the turf fields at the various schools she is considering. Do they have a shock pad under their synthetic turf? What type of fill do they have?...these may be questions I pose in the future. The other speaker for the first session was Justin Newell, the Assistant Athletics Director for Kenyon University. Justin spoke about the Sport Safety Institute and the work they are doing with the NCAA. His hope is that as the NCAA develops opinions about field safety standards, and supports the work of organizations such as the Sport Safety Institute, that then High School programs will follow suit. I guess my big take away from this first session was the idea, as Justin said, "Standards is a difficult word and a Risk Management flag." And, I agree. The issues we potentially face with our fields are enormous. If we do institute standards - how many fields will fall outside these standards? Will fields therefore be shut down and kids not have access to sports? Where do we need to go with this discussion so our children are safe, and we find the balance between field accessibility and safety? There are financial constraints…of course…Institutions must find a way and means to do what will be most safe for the student athletes – they are the ones they are responsible for. BROCK and the research they have done have paid dividends for me as a coach so I can feel like I have done everything I can to make sure my players are safer here at Dartmouth. The second and third session this morning was filled with a ton of data...to be honest - WAY OVER MY HEAD. I'm feeling like I need a nap! Biomechanial Testing of Impact Attenuation in Sport Movements on Synthetic Turf with Shock Pads. Using Player Feedback to Improve Surfaces. What I can say is that it was reassuring to to hear about all the testing that is being done about movement and synthetic turf and natural grass in hopes of making fields better for the athletes. There has been an interesting study happening with the Scottish FA about fields and professional players' perceptions of fields in Scotland. What was determined is that players prefer natural surfaces over synthetic surfaces. And in a blind study (where the players had no idea of the specifics of the synthetic surfaces) they, by far, preferred fields that had a shock pad installed with them, than not. With this in mind, I texted my daughter and asked her to rank her favorite synthetic fields she trains on regularly - and her rankings correlated with these results as well. Her favorite two fields had BROCK shock pads, her third had a different company shock pad, and her least two don't have pads and are old and likely ready for replacement. Interestingly, with the results of the study, the Scottish FA has now required all synthetic surfaces to have shock pads installed in them. Athletes prefer synthetic surfaces with shock pads over synthetic surfaces without them. Wow - I really have just just say - WOW in this moment as I am learning more and more about testing for fields and what is currently the standard and what more is available in terms of more accurate testing. I'll do the best I can to explain. The current standard for field testing is what is called the GMAX. The GMAX is a cylinder with a flat bottom that is dropped from a certain height and a score is therefore calculated. For a field to "pass" they need to score a certain number from a certain number of tests from both specific places on the field as well as random places determined by the tester. When a new field is being put in, the specifications for the new fields will likely require that the fields be tested after a certain number of years with the GMAX testing. This testing was originally established as a United States standard by Monsanto - the original developers of synthetic turf. Just about every expert in the room today (every one I heard speak) said that while the GMAX testing certainly provides data...it is not a good test. A MUCH BETTER test is called the HIC test. One of the reasons this is a better test is because of the missile that is dropped. It is not a cynlinder with a flat side...it is shaped more like a head so it's much more accurate in determining the force of the impact and how it is dissipated. I will have some interviews in the future about these two tests...but I can say that in the future of the synthetic turf industry - I would imagine we will move to the HIC test as the standard in the United States. This is part of what FIFA mandates for their standards and what is largely done across Europe. The bigger issue that has come up for me today as the result of this conference is the concept of standards when fields are being built. Right now, there are no industry accepted standards for safety of fields and so therefore many decisions are made by general contractors securing a bid. As I mentioned, there are lots of architects here. I just was talking to a number of them and asked them how standards are implemented in their industry. For instance, when a new building code is being implemented, how does that process work? How can we institute safer standards for our children when it comes to field safety and field performance testing without causing a national crisis that will shut down many fields? So - as standards are developed and agreed upon - they need to be instituted for new projects and for existing projects who meet certain thresholds in terms of the amount of money they are putting in to a renovation. So - for instance - over the course of the next 10 years as the fields are being replaced, we can have safer fields for our children to play on. The other key concept I am walking away with today is that fact that parents need more education. We need more information from non-biased parties about what is acceptable and what the difference is between X and Y. This is especially the case as more and more fields are being built. When parents enter the conversation and our municipal governments and sporting organizations are thinking, albeit in the back of their mind, about the response parents will have to the choices they are making about the fields that will be installed - then we will likely have safer fields built. While the number is not exact, it's estimated that approximately 1800 fields were installed in the United States in 2017. Interestingly, 30 percent of those are replacement fields. The number of synthetic turf fields are here to stay and growing. Skin abrasions will happen on an surface - grass or synthetic turf as a matter of friction. Not all synthetic turf is the same. The research is clear that some fills, pile lengths, quality of the fibers, and density of fiber can create affect skin abrasion. From the study we discussed this morning, cork fields are the worse when it comes to abrasions. Temperature and skin abrasion are connected. These next two sessions (I am listening to one now) has been about replacements of fields. The first was a company that recycles old materials (instead of fields making their way to the landfills). While I don't believe there are any such recycling facilities in the United States now (I don't think they have competitors as their process seems quite proprietary) - this company - Re-Match has plans to build 5 factories in the United States in the next 12-18 months that will be able to properly recycle old fields. (he mentioned one factory specifically in Eastern PA ,and one in California). Mark Heinlein from Turf Reclamation Services just did a really informative presentation (he had good pictures) about Best Practices for Turf Replacements Over Shock Pads. At first I thought I wouldn't be too interested in this presentation....but as he started speaking I realized this is a really important topic for youth soccer parents. Many of us sit on Boards that are making decisions about turf replacement. It's really essential that you hire a qualified and experienced company for a turf replacement project! If you have a field that does NOT have a Shock Pad but you want to add one to make it safer from a concussions safety standpoint, it is possible to add one with some additional engineering and drainage, infill choices. What seems like will be a relevant panel for soccer parents is happening now...about Standards for Field Safety. FIFA, FIH (Field Hockey) and World Rugby have combined resources to identify best practice for multi-use long pile community based fields and provide information to facility owners, managers and investors in ensuring that their fields achieve the highest possible standards. Some sports have, in addition to those listed here, additional requirements for elite level fields, details of which can be sourced from the individual sports. 60% of the fields I test from a Performance Standards - do not pass, but they pass for GMAX." We are measuring for planarity (base, infill uneven, seams open) or components of the field (manufacturer did not deliver the field that was specked out). They all pass the GMAX though." That does not happen (manufacturers don't deliver non-specified materials) in Europe because they know it is going to be performance tested." So - the takeaway here - is that it's likely a good idea to write PERFORMANCE STANDARD TESTING into your specifications for bid, NOT JUST A GMAX TEST. And, to take that further, it really is clear that everyone in the room (except likely the companies that only do GMAX Testing) - feels like we must move our testing standards from GMAX to HIC. There is no reason why we can’t use HIC - it’s just a matter of it being written into the standards. There was a brief discussion from Rolf Hubbard related to what I mentioned yesterday about HOW new standard introduced to the market. He said we need to realize these standards are going to have to be gradually implemented so fields are not necessarily shut down - but rather when new fields are installed or old ones refurbished - they need to then meet the new specifications. We are wrapping up the Summit this morning with a discussion on Risk Management. Kristi McClure Huckaby from the University of California, Long Beach is speaking. She has had a career in Parks and Recreation Management and bringing up some good points about maintenance plans and usage plans. When does a field become unsafe based on weather, how often is a field checked and how are issues on the field handled, are you tracking injury data? I know many of the fields our children play on are maintained by municipal government, so we just make the assumption they are safe. For those of you on soccer Boards - a Risk Management plan needs to be put in place for the fields your club utilizes.